It doesn't get any better than this! 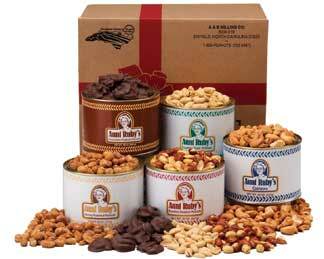 A Gift Package that has all of our roasted products, plus our delicous Chocolate Peanut Clusters: • one 20 oz. 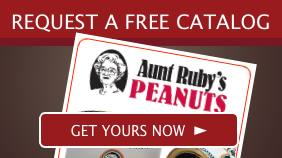 tin of Aunt Ruby's Chocolate Peanut Clusters • one 20 oz. tin of Country Style Peanuts • one 20 oz. tin of Honey Roasted Peanuts • one 20 oz. tin of Roasted Redskin Peanuts, and • one 20 oz. tin of Roasted Cashews! Guaranteed to please!